The exam season is on and the preparations has to be in a different level to ace the exams and to be the best. Also if you see the PGDBF Exams are coming in the next forthcoming days and you have to fire up your preparations. We have been getting requests to provide the Legend Magazine to steer up the preparation for the upcoming Exams. The Syndicate Bank PO & Canara Bank PO PGDBF Exams are coming in the forthcoming days and both the exams have Current Affairs and Banking Awareness in the First Phase of the Exams. So it is a section of utmost importance and this will escalate your marks to the next level. 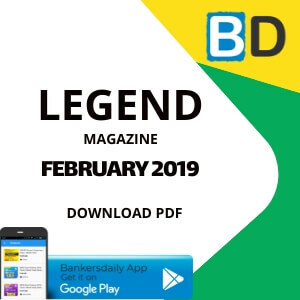 This LEGEND MAGAZINE consists of the Current Affairs in the month of January and also with important Current Affairs Quiz and also with Banking Awareness and Aproximation Questions which will be useful for the Preparations. We have been providing this as PDF to enhance the aspirant’s preparations and also to prepare for the LEGEND exam. 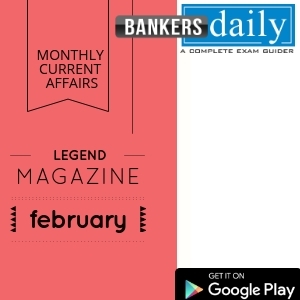 This material is an “ONE STOP SOLUTION” for all the current affairs and also for the Banking Awareness section, So you can read this and get benefited. The exams happening now are labyrinthine and candidates should prepare extensively for this section for the upsurge of the marks in all the sections. If you can attend these Questions , then your preparations are in a different level, if you cant answer most of the questions, don’t worry, check the Legend Magazine and boost your preparations. Q.1) Which of the following Indian state has recently declared as an Open Defecation Free state in North East Region of India? Q.2) Maharashtra sanctions, how much amount for farm loan waiver Scheme? Q.3) With easy access to information on government Schemes and initiatives for women, Union Minister Maneka Gandhi inaugurates online portal named _______. Q.4) What is the constituency of Women and Child Development Minister Maneka Gandhi? Q.5) Which state government has obtained approval to get electric vehicles under FAME-India Scheme? Q.6)India’s second largest rooftop solar plant in Uttar Pradesh generated how much electricity? Q.7) National Register of Citizens (NRC) was released in which of the following state? Q.8) Who is the Registrar General of India? Q.9) Recently Saudi Arabia and which country introduced the Value Added Tax (VAT) for the first time? Q.10) Senior diplomat Vijay Keshav Gokhale has been appointed as the next________. Q.11) Vidarbha won the Ranji Trophy title for the first time by defeating which team? Q.12) Anwar Jalalpuri passed away recently is best known for which language poetry? Q.13) Who is the Minister of state for finance? Q.14) Who launched the Allied and Healthcare Professionals’ database portal? Q.15)Uttarayan festival is celebrated in which of the following state? Q.16) Telangana launches 24-hours free power supply for which category of people? Q.17) Which of the following country has allowed the Chinese yuan or Renminbi to be used for bilateral trade and investment activities? Q.18) India and Pakistan exchanged the list of nuclear installations and facilities through diplomatic channels since_______. Q.19) State Bank of India and NABARD have signed an agreement for the promotion of 2,500 joint liability groups (JLGs) in which Indian state? Q.20) What is the abbreviation of MDR? Q.21) Who is the Chairman of NABARD? Q.22) HSBC expects India’s’ growth at around how much percentage in the fiscal 2017-18? Q.23) Where is the Headquarters of HSBC located? Q.24) What is the capital of Mali? Q.25) Samudra Manthan – Caring Organization of the Year award is received by which port? 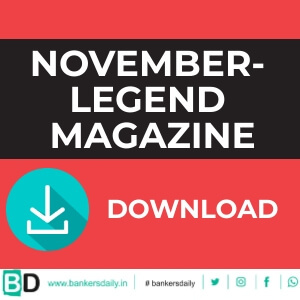 bankerdaily missed to update …there is no Dec month legend magazine …. Sir please provide SAMRAT pdf material in the online portal or in bankersdaily website. Pdf of January not available in portal to download.